Q: What is the difference between “sympathy” and “funeral” flowers? sincere care and convey your wishes for peace. Sympathy flowers are usually smaller than the funeral arrangements. 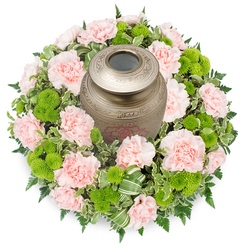 Q: Are there any flowers that are not suitable to be sent as funeral flowers? 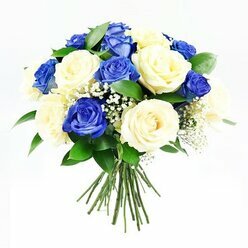 Q: Are there colours which are more appropriate for the funeral flowers? ● purple is considered to be the colour of royalty and admiration. Q: What kind of funeral arrangement should I choose? 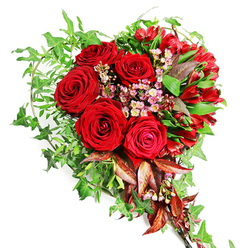 Heart-shaped tributes are a lovely way to express your warmest feelings and sincere love to a special someone. They are usually sent by close relatives. Casket sprays are usually the main family tribute which is placed on the coffin. Crosses and cushions are traditionally sent by close relatives. 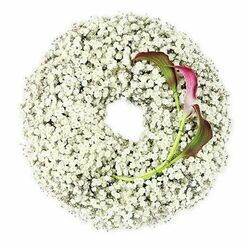 Wreaths are widely preferred funeral arrangements because of their circular shape which symbolizes the circle of life. Posies are round arrangements that are traditionally send by distant relatives or younger children. Floral baskets can be sent both as sympathy and funeral flowers. You can also choose to send more personal tribute such as a letter tribute. This is a lovely way to express your deep love and caring thoughts. Q: How to arrange the delivery of the funeral flowers? flowers. 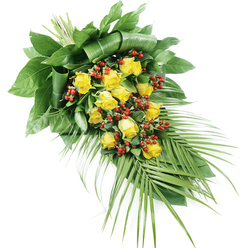 You can order the arrangement to be delivered for the next day. Next day delivery is available for orders placed before 4pm. Q: There is something else I would like to ask. A: At Handy Flowers we understand the difficulty each of us goes through during a time of loss. Don't hesitate to call our team to ask whatever questions you might have in regards to your floral needs. We are here to discuss your requirements and answer your questions. Please contact us on 020 3409 3030 or write to us at [email protected] to make an enquiry.